Welcome to the Mistress Brewing Company Events Calendar. Randall Fridays at Mistress Brewing Co.
Live on the wild side - enjoy an infused beverage with your Mistress! 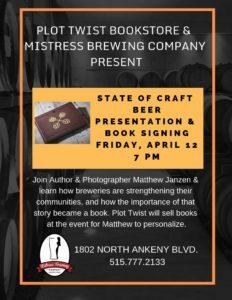 Join Author & Photographer Matthew Janzen & learn how breweries are strengthening their communities. Plot Twist will sell the books and Mistress Brewing Company will host the event.